>> REVIEW: Is This The Holy GRAYL of Filtered Water Bottles? 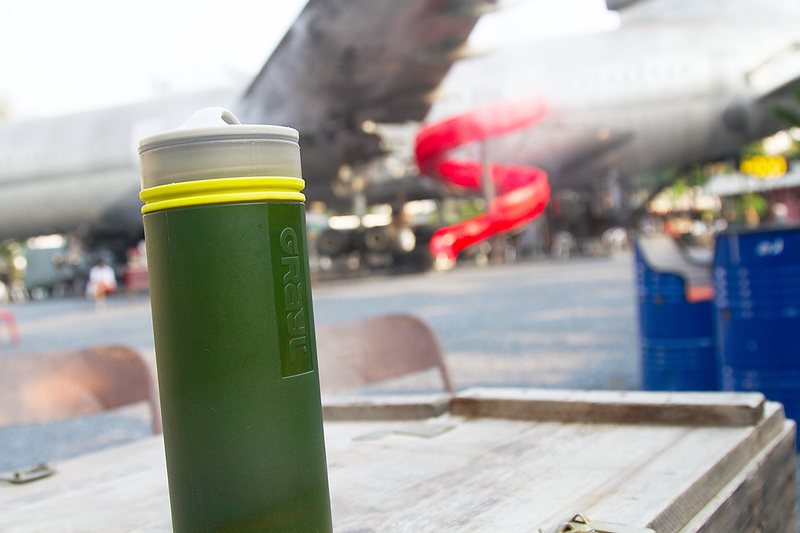 Chilling with my GRAYL water bottle at ChangChui Market in Bangkok. Coming from a country that has water clean enough to drink straight from the tap is something no one should ever take for granted. Us lucky folk are certainly in the minority. No really, we are. This presents a real problem when travelling. Yeah, you can purchase bottled water on the go. But this costs precious, precious money and causes unnecessary wastage. The answer then seems to be to carry a reusable water bottle wherever you go. Yet, what do you do when you’re in a country where you’re unable to drink the water straight from the tap? Make do with boiling it and risk possible sickness? Use Iodine tablets, which leave a rather unpleasant aftertaste? It seems a filtered bottle is the best answer. However, there are quite a few out there – finding the perfect bottle is no easy task. I should know. I’ve been searching for one for over three years. What is the GRAYL water bottle ideal for? The inner press of the GRAYL leads down to a filter. I had heard about the GRAYL water bottle on “the street” and was immediately intrigued. I have had a reusable water bottle for most of my teenage to adult life and the bottle ticked off a lot of things on my list. It’s lightweight (weighing around 300g or 10.9oz) and easy to manoeuvre. It comes in lots of bright and pretty colours (which I find appealing, don’t judge me). Once the lid is screwed on, it doesn’t leak – you’d be amazed by how many bottles don’t pass this extremely simple test. And what about filtration? The bottle disassembles into four parts – the outer re-fill, inner press, loop cap and replaceable purifier cartridge. 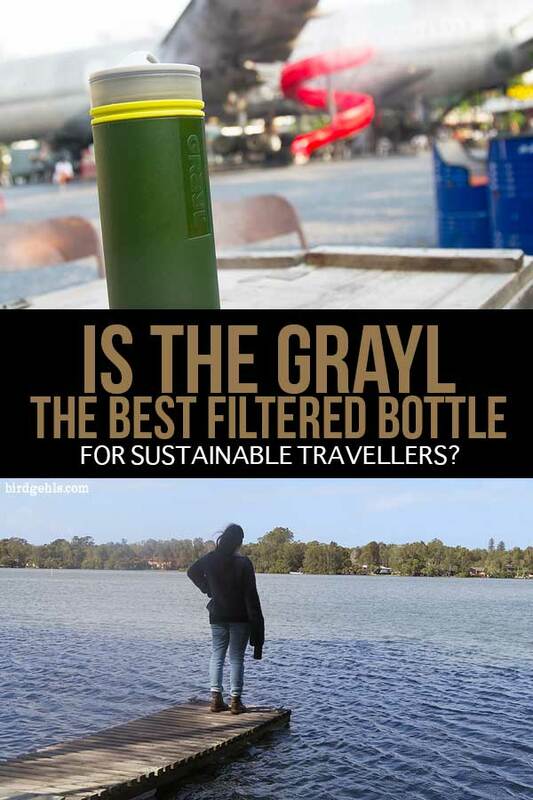 Buy the GRAYL Ultralight Water Bottle here! The purifier removes 99.9999% of viruses, bacteria and cysts (see complete list here). You fill the outer shell up to the marked line, then push the inner press into the bottle. The water is forced up through the filter and as it passes through, it’s rendered safe to drink. It requires a tiny bit of muscular effort to get the bottle down at first, but once you get into the hang of it, it’s fine (I like to think of it as being incorporated into my daily workout). The filter cartridges are safe for around 300 uses (150 litres or 40 gallons worth of water), before they need to be replaced (see prices here). So this is how the bottle works in theory and I had great fun using it in my travels around Australia. Yet, how did it fair during a recent trip to Thailand, where the water is not fit for consumption? 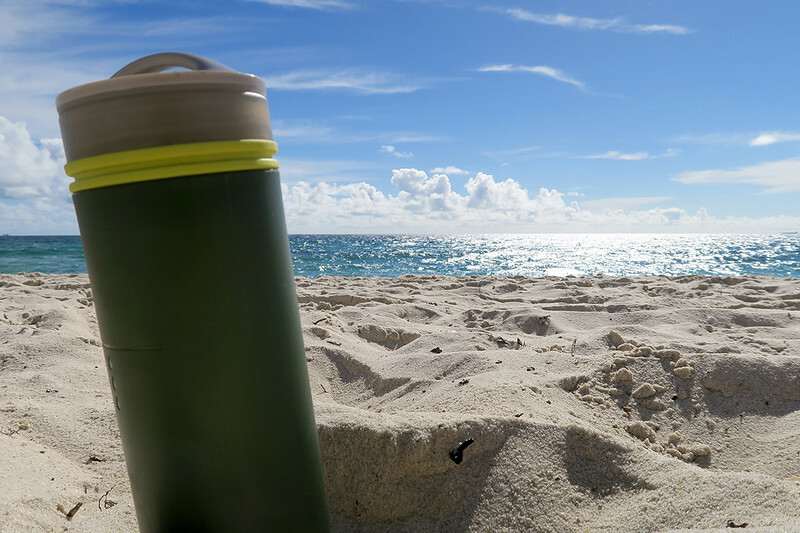 My GRAYL bottle soaking up the sun in Perth. I have a very sensitive stomach and it has driven me mad when travelling. If there is the slightest thing wrong with the water I am drinking, I’ll be bedridden for the next few days, no longer in any sort of control of any of my orifices (there’s some lovely visual imagery for you). I travelled to Cuba a few years ago and believe I accidentally drank some tap water that had been mixed into juice. I was a very sick lady after that, indeed. So, I travelled to Thailand in 2018, with my bottle by my side. I used it in Bangkok, Ao Nang and on Koh Lanta and I did not vomit, not even once. This is a glowing endorsement. The GRAYL water bottle is delightfully straightforward. You fill it up from a water source, push down the inner press and you have 500mls of water, ready to be drunk. My GRAYL water bottle and I contemplate life, the universe and everything else. 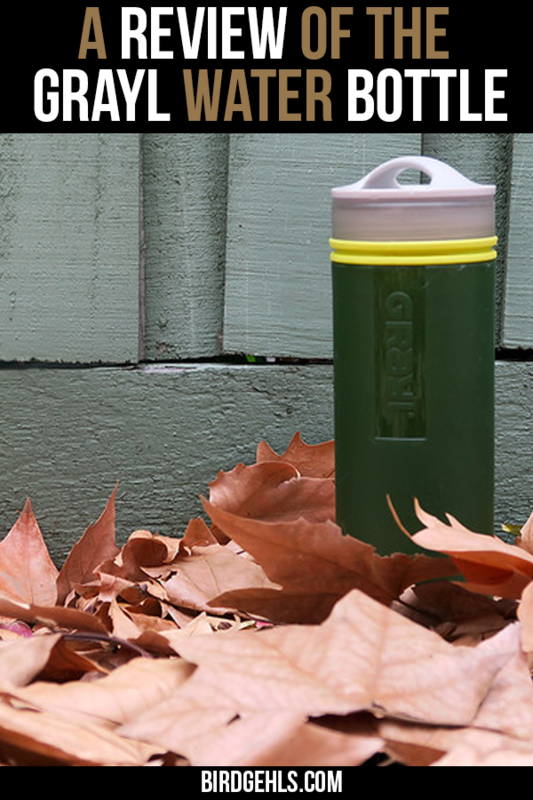 The GRAYL water bottle is almost ridiculously easy to use. If I can navigate my way through it, then so can you. Step 1. You separate the filtered section from the outer part of the water. Step 2. You fill up the outer part of the bottle with water. Step 3. You push the filter down into the bottle. Step 4. You drink the lovely water and don’t get diarrhoea. I also love that the Ultralight bottle is as the name suggests, ultra light and that I can pack it as carry on on planes and the like, without it taking up too much weight (plus you can attach a carabiner or cable to the lid so you can fasten it onto your backpack). 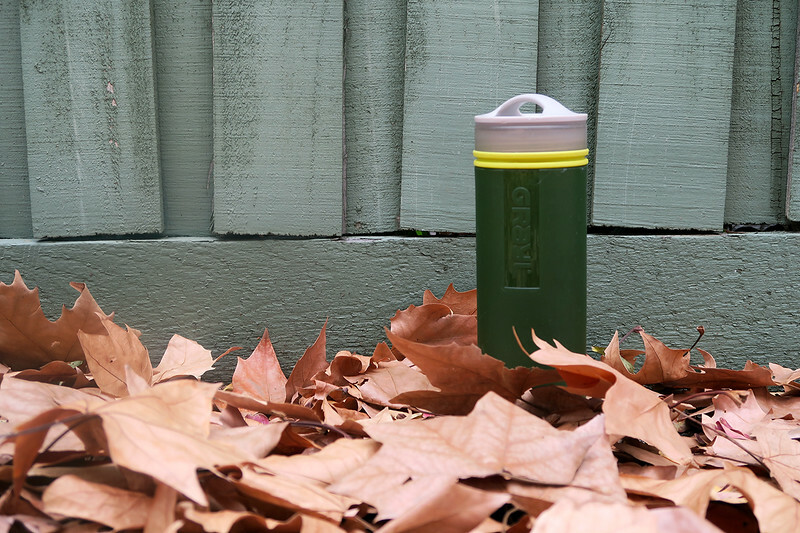 GRAYL – a bottle for all seasons (I couldn’t think up a suitable caption for this, sorry). My only complaint is the size of the bottle. I drink a lot of water and travel just about everywhere with a 750ml (25oz) stainless steel bottle. My GRAYL water bottle is half a litre, or 16oz. This is fine when around water sources, as I can simply keep filling it. However, if I’m not around any taps or am on a long bus, boat or car journey, there can be issues. I don’t always have enough water in the bottle to see myself through to the next water source. One thought I had is to bring along a hydration bladder – but then, that’s another thing to lug around. I’m sure that in time, the company will come up with a viable solution. I’m still saving money by using this bottle, as well as keeping my plastic usage at a minimum. It can only get better from here. Travelling overseas, obviously. Yet, it’s also a fantastic addition to your hiking or camping kit, as you can fill it up from natural sources. I will soon take it bushwalking in the Grampians in Victoria, Australia when I make it out there and use it in conjunction with taps and freshwater sources. The GRAYL and my She Wee will make me the envy of ALL of my friends. I believe so, at least. In all seriousness, the GRAYL Ultralight Purifier is highly recommended. It’s stopped me from wasting a heck ton of plastic, which is something to be grateful for. I won’t be travelling overseas again without it. If you want to find a place near you which stocks the GRAYL, use their website’s store locator. View the full archives of my war on plastic here. Please note: GRAYL provided me with a water bottle to review. I am not a healthcare professional and this article is written from my own personal travel experiences. Hey, I really wish I’d had this on my last trip to The Gambia and Senegal. I put a link to this article in my packing list article. Thanks! Thanks lady. It would be perfect for Africa! I was wishing I had it when I went to Kyrgyzstan – I boiled water and then got sick. :/ To the future, I guess! That’s perfect! I’m going to take a hydration bladder for my next trip, I think. 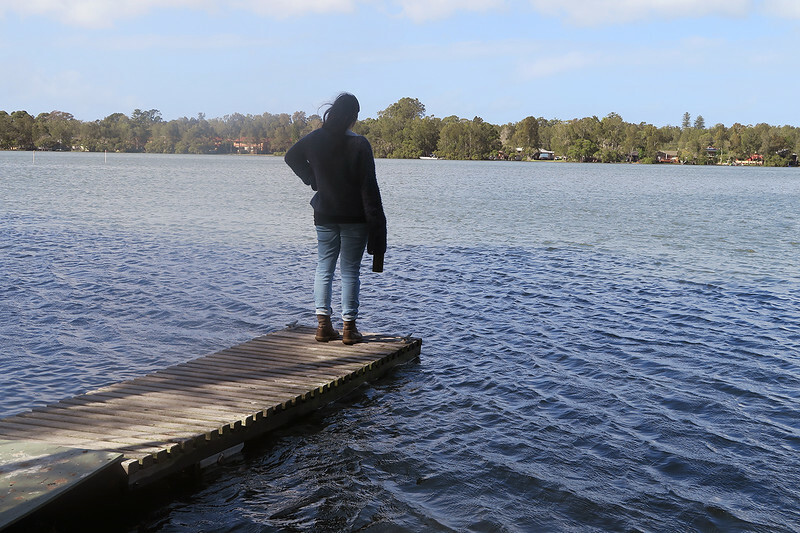 I like to go on boat rides too much when travelling and that presented a problem, haha. The GRAYL water bottle might just be the one I have been looking for myself. I am starting a trip around the world and was thinking about buying a reusable water bottle with filtration. Unfortunately, I have the same issue as you. I was looking for a bottle that is at least 750 ml or more because I drink a lot during the day. I guess one can’t have everything and I might just give the GRAYL a try (if I can buy it in Japan). 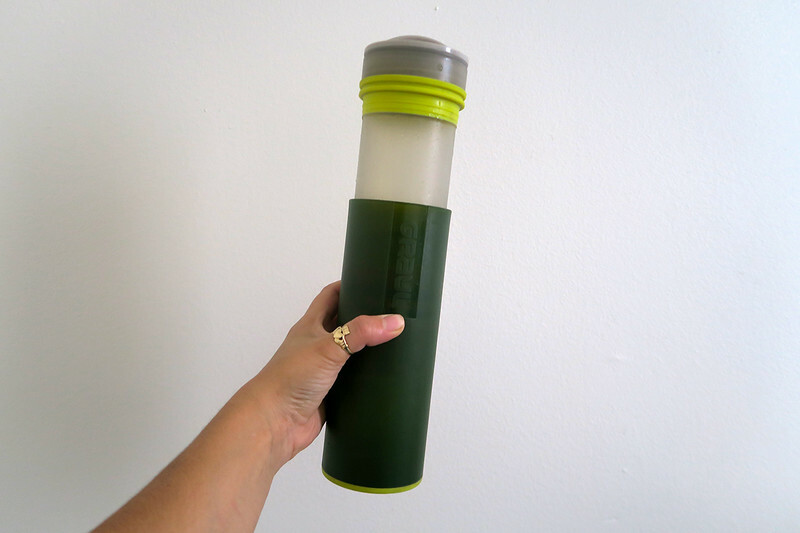 We have been looking at this filtration bottle for awhile now so great to read your review. Do you know where you can buy them in Melbourne? Hi Dawn, looks like online is the only choice in Melbs for now – did a quick google and this store is having a sale. I was trying to contact GRAYL, this looks like the best water bottle ever! Im tired of running out of water on hikes lol the waters looks pretty clear in NZ but just in case, this would help so much! I think it would be perfect for hiking in NZ! I’n hoping to make it over there eventually and will definitely be taking mine with me.